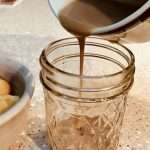 This caramel sauce is very tasty on so many dessert delights! I’ve used it on the pumpkin bars, as well as the one bowl apple cake. It also sweetens Greek yogurt that doesn’t have added sugars. Place coconut milk fat, coconut sugar, and honey (or maple syrup) in a saucepan. Allow sauce to cool for 5 minutes. Stir in shortening or butter until dissolved. Serve over your favorite dessert!